This book explores the relationship between three African American women's dance-art-music sensibilities within the context of a Pan African aesthetic. 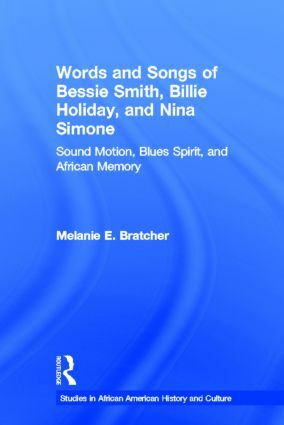 Its purpose is three-fold: to show commonalities between Bessie Smith, Billie Holiday and Nina Simone's lives and original compositions; to codify, examine and evaluate their selected song performances in accordance with the Pan African aesthetic "Nzuri theory/model;" and to illuminate the vast sources of transformational values that aesthetic analysis of African American song performance can foster. Following concordant procedures and principles of Afrocentricity, the study focuses on Smith, Holiday and Simone's performances as part of a whole African artistic and cultural value system. The goal of the Afrocentric methodological structure is to locate relevant African dynamics in songs and to promote knowledge for cultural transformation and continuity. Its use in this study provides meta-criteria for analyzing African American music, which the author has used to uniquely argue connections between African cultural memory and African-derived cultural expression.